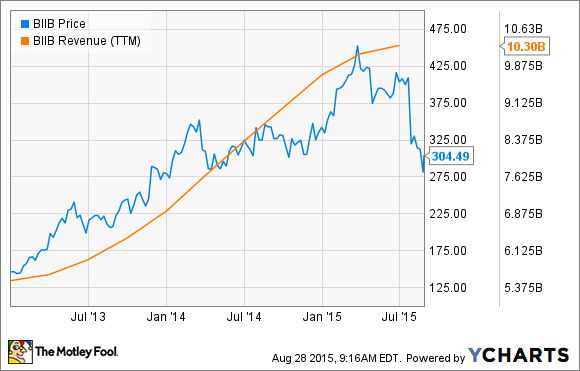 Will Incoming Competitive Threats Sink Biogen? Safety issues could blunt this company's competitive edge. When Biogen (NASDAQ:BIIB) began the U.S. launch of multiple sclerosis drug Tecfidera a few years ago, few expected its runaway success. In an already crowded field, it quickly rose to take the title of most prescribed treatment in its class. Total revenue for Biogen has nearly doubled following Tecfidera's launch, and until recently the stock had performed even better. Now it looks like the party's quickly coming to an end. Biogen expects U.S. revenue from Tecfidera to not only decelerate but also remain flat for the year. Since it comprises more than a third of the company's total sales, this news is weighing heavily on the stock. Ahead of the recent sell-off in the broader market, Biogen shares were already more than 20% below peaks seen just ahead of the latest earnings call. With things looking so dire, you're probably asking yourself: Are Tecfidera's reduced expectations due to competition from the likes of Sanofi and Novartis (NYSE:NVS), or possible cases of treatment-related brain infections? More importantly, should investors be worried about these threats? Before getting into what's happening now with Tecfidera, let's take a step back and look at the competitive landscape for oral multiple sclerosis therapies. First to win approval was Gilenya from Novartis. Its launch went swimmingly, and the drug reached blockbuster status in less than two years despite serious potential side effects. Sanofi's Aubagio was next to market after winning FDA approval in September 2012. As it's a metabolite of rheumatoid arthritis treatment Arava, physicians were already leery of potential side effects, such as fatal liver failure. The FDA's inclusion of a black-box warning similar to Arava's on Aubagio's label didn't help matters any. As a result, sales of the drug have been disappointing, reaching just $433 million last year. The important takeaway from the first two oral MS treatments is the magnitude of the impact that potential safety issues can have on the commercial success of these drugs. Treating this disorder is especially challenging. For example, it's not uncommon for patients to lose significant limb function within a few years of showing symptoms, only to stop progressing for decades without further treatment. The last thing a doctor wants to do is prescribe a drug with serious potential side effects when it could be unnecessary. This is a part of the reason Tecfidera took off like a rocket, even though it was the third oral MS therapy to win approval. Less than a year ahead of Tecfidera's launch, a case of progressive multifocal leukoencephalopathy was reported in an MS patient taking Gilenya, casting quite the shadow of doubt over Gilenya's safety profile. PML is an uncommon but deadly brain infection caused by the fairly common JC virus. Healthy immune systems typically keep the virus at bay, but agents that prevent the immune system from attacking healthy neurons can also lower barriers that keep the JC virus from developing into PML. Last November, Tecfidera's safety record also took a hit when the FDA added information concerning a reported case of PML in an MS patient treated with the drug. It was noted that the patient had a very low number of lymphocytes, a type of white blood cell, that could have contributed to the development of PML. The chart displayed earlier in this article shows that the deceleration in Biogen's revenue coincides with the report. Tecfidera may have simply reached a saturation point in the U.S. market, or maybe physicians are exhibiting extra caution. Another swipe occurred more recently in the Netherlands, when a woman receiving a locally compounded version of Tecfidera's active ingredient -- not Tecfidera itself -- also developed PML. This patient was being treated for psoriasis, not MS, but her lymphocyte count was normal. Again, Biogen's drug isn't necessarily the culprit, but following this report, its advantage over Gilenya isn't what it used to be. Gilenya isn't the only competitive threat Biogen faces from Novartis -- Biogen also has to worry about Glatopa. Developed by Novartis' Sandoz unit in partnership with Momenta Pharmaceuticals, Glatopa is essentially a generic version of Teva's MS drug Copaxone. The biosimilar received FDA approval in June and is already off to an impressive start. When Novartis reported its earnings in July, Glatopa had been on the market for just over a month, but it had already made an impact on the company's income statement. Global sales for Sandoz's biopharmaceuticals segment reached $222 million for the quarter. That's a 57% gain compared with the same period last year, although much of the rise could be due to a buildup of inventory shipped after Glatopa's approval rather than actual prescriptions written. With a wholesale price of $54,900 per year for Tecfidera, Biogen investors are right to be concerned about seeing any inexpensive MS treatments entering the market. However, this won't be the case for Glatopa. Although it's essentially a generic form of Copaxone, it isn't cheap. Novartis intends to price Glatopa at a whopping $63,000 per year, so price-based competition isn't likely to be a factor for Tecfidera. Beyond pricing, Tecfidera may have the advantage of increased efficacy compared with Glatopa. During a pivotal trial that led to its approval, Tecfidera reduced annual relapse rates by 44% over placebo. For patients receiving Copaxone, the average reduction in annualized relapse rate was 28%. It's important to note, however, that these results came from different studies, so this comparison should be taken with a grain of salt. With 12 disease-modifying MS treatments on the market, competition in this space is intense. That said, there is a strong tendency for patients to stay on a drug even if it may be inferior to new therapies. This is part of the reason Copaxone and Glatopa continue to do so well in spite of Tecfidera being arguably a better drug. Copaxone has a very well-established safety record after 19 years on the U.S. market. Following reports of PML in next-generation oral treatments, that longevity does even more to bolster its popularity. Physicians dislike uncertainty even more than stock markets do. For now I expect doctors are taking a breather to reassess Tecfidera's risk-to-benefit profile. If the drug is blamed for another case of PML in the years ahead, Biogen investors can expect further losses. But unforeseen catastrophes aside, I really don't see the competition's cannons sinking Biogen's MS-treatment ship.